Venice shopping can entail unbelievable options. You can wander through typical narrow streets, simply ambling along while browsing into shop windows until something commands enough attention from you that you feel compelled to enter the shop. The offerings include Murano glass from the nearby Murano Island, fine handcrafted linens, a multitiude of souvenirs such as t-shirts and items with the name Venice proudly painted or etched on it. Interspersed with the shops are trattorias, bars and restaurants for those who get thirsty or hungry on their souvenir pilgrimage. Murano glass has been crafted since the 10th century on its namesake, the Island of Murano. Although the glass-making craft in Murano is supposed to have originated in Rome, there were influences from other areas that became incorporated into designs because Venice was a major trading and shipping port. Today, these artisans still use techniques dating back centuries, to create sparkling cascades of chandeliers and brightly hued imitation gems that in many cases rival the originals. Venice shopping includes...of course... Masks! Venetian masks are famous for their originality and unique flair. The masks are most commonly worn during "Carnevale" (Carnival of Venice). The masks allowed the wearers to interact with other members of society when identity and social status wished to be hidden. Of course it was abused by a few criminals but romantic encounters abounded. A number of the smaller shops make their own Venetian masks by hand and have designs that aren't seen repetitively in shop after shop. The Venetian masks have elaborate designs with bright colors usually highlighted with gold or silver. The complex decorations are in the baroque style. The can be full face masks (bauta) or eye masks (Colombina). There are no two masks exactly alike...although there will be variations, unless you are getting the "Made in China" tourist copies. There should be a label of authenticity attached to the mask, usually on the black ribbon. We purchased a few for gifts and chose two very unique masks to hang on our wall...like masterful paintings. There is another mask called Medico Della Peste (The Plague Doctor). It has a macabre appearance with a long beak-like nose. It was worn with a black hat and long black cloak as well as the mask, white goves and a stick. A 17th century French doctor created it to help with sanitation while dealing with plague victims. 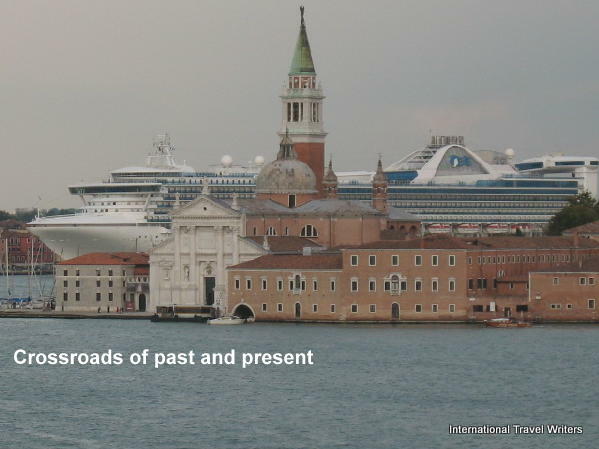 Another Venice shopping area that mainly has tourist souvenir items is the Promenade along the Riva Degli Schiavoni. This promenade starts outside the Doge's Palace and is a great opportunity to take a stroll along on the waterfront of San Marco Basin. During this walk you can be viewing shops in kiosks or people watch from one of the many restaurants and bars that line the area. You pass some of the hotels that once functioned as palaces. One of the hotels lining the promenade is the Londra Hotel, another of the many converted palaces. Across the promenade and visible from their lagoon view rooms is the spectacular bronze monument dedicated to King Vittorio Emmanuele II. 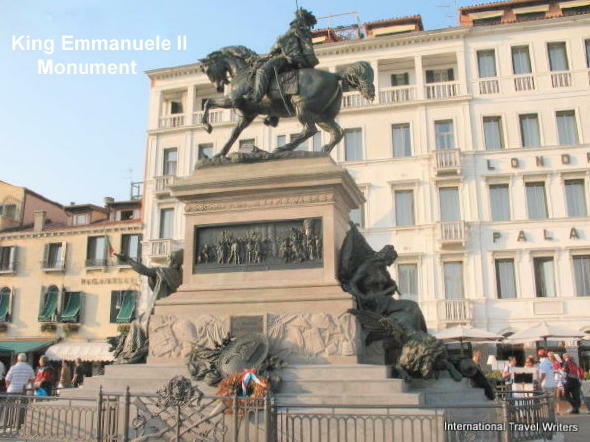 He was the first king of Italy. It dates from 1887. A little further along the promenade is La Pieta (Church of Santa Maria della Visitazione). This was the home church to the composer Vivaldi. We enjoyed staying one of the restored residences of Vivaldi, with unbelievable views that could have been inspirational to him, the Locanda Vivaldi Hotel.